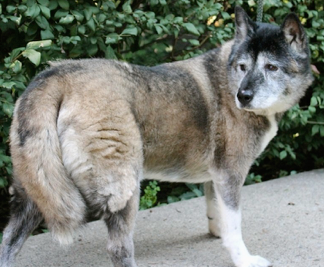 This photo shows just one example of the many senior Akitas that B.E.A.R. has rescued from situations just like the one in the story below… Could you imagine living your entire life in what you thought was a loyal and loving home, but then as you slowly start to age over the years, the family you love decides one day they just plain don’t want you anymore because you’re too old? The shelter door opens, and this is the last day you will ever see the sun shine. But then, a B.E.A.R. volunteer stops by and says, “Come on, old loyal friend, it’s time to go home.” Please make this possible and donate. An Akita’s life depends on it. We rescue dogs of all ages, but the seniors have a special place in our hearts.